The ex-governor and VP pick railed against political consultants at CPAC. But her latest FEC filings show they took millions of dollars from her in the last election cycle. Sarah Palin attempted to relaunch her political career and her political action committee, SarahPAC, on Thursday with a Web video called “Loaded for Bear,” which presented the former Alaska governor as the new kingmaker for conservative populists in the GOP. 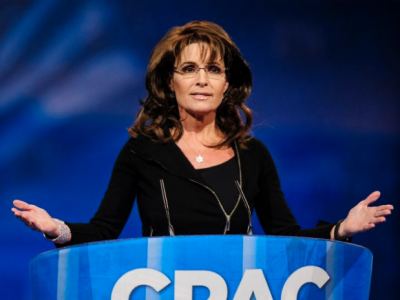 The video riffed off her speech at CPAC, in which Palin railed against “the big consultants, the big money men, and the big bad media.” But there’s an irony alert ahead: the current stated purpose of SarahPAC is to raise money ahead of the 2014 election—most of which will be spent on conservative consultants. Don’t believe me? Well, this is a perfect time to page through SarahPAC’s Federal Election Commission filings, which—helpfully enough—were just released yesterday. Seen through the lens of the invaluable Center for Responsive Politics, Palin’s PAC spent $5.1 million in the last election cycle (more than it raised in that time period, raising some questions about Palin’s claims of fiscal responsibility). But the real news comes when you look at how donors’ money was actually doled out: just $298,500 to candidates. The bulk of the rest of it, more than $4.8 million, went to—you guessed it—consultants. That’s some seriously hypocritical overhead. In total, Palin’s PAC spent $980,000 on campaign expenses, $1.3 million on administrative costs (including almost a million dollars on postage), and three-quarters of a million on fundraising. Hidden in all of this—amid the direct mail and the media buys—is consultants’ cut of every dollar spent. These are the top-line costs of life in PAC era. But the devilish details in expense reports are what makes it really come alive. Palin’s chief PAC consultant, Tim Crawford, pocketed more than $321,000 this election cycle in direct payments alone, according to the documents. Aries Petra Consulting was taking in between $6,000 and $8,000 a month for speechwriting and “grassroots consulting”—something that sounds like an oxymoron, but ended up costing north of $160,000. C&M Transcontinental racked up $10,000 a month in management consulting, which is hard to imagine for a PAC whose job is simply to raise money and spend it on candidates. Inside SarahPAC, there were consultants for research and consultants for logistics and consultants for issues and on and on and on. It’s hard to find any area where consultants weren’t employed. So when Palin thundered at CPAC that “Now is the time to furlough the consultants, and tune out the pollsters, send the focus groups home and throw out the political scripts, because if we truly know what we believe, we don’t need professionals to tell us”—it was a riff written by speechwriters and informed by all tools she tried to diss. Follow the money in politics and you get a glimpse of the truth. Sarah Palin wants to be a defender of the middle class while chartering $27,000 private plane flights and burning through enough cash on consultants to feed a small village for a year or two. As much as advancing a political cause, SarahPAC seems to be a lifestyle play, propping up an expensive ideological entourage. Also buried in the report are signs of Palin’s decreasing popularity, which may explain the anxiety to raise a new round of cash now. Because the vast majority of the money she raised for SarahPAC this cycle came in 2011, when there was still feverish expectation that Palin would run for president. When she retreated, the citizen spigot dried up. After raising nearly $6 million in the 2010 Tea Party cycle, Palin’s PAC is down to “just” over $1 million cash on hand. While that’s impressive for a former governor and VP nominee, it’s not the kind of cash flow that a real party leader shows. Now she desperately needs to reload her donor dollars and so the Sarah Palin show is back online, trying to reassert her relevance. But don’t kid yourself—it’s all about the Benjamins. This entry was posted in Featured Columns and tagged Elections, The Daily Beast, Wingnuts. Bookmark the permalink.